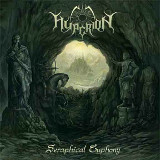 It's appropriate, I think, that I close out the end of this year with an album written at its beginning: Hyperion's first LP, Seraphical Euphony, which I just discovered this week. It's hard not to mention Dissection when talking of this debut, but I'll merely say that if you were enamored of that band's two classic albums (really, is there anyone who wasn't? ), this is very likely to appeal. The Swedes combine a similar melodic style with a mastery of their extreme metal influences from both black and death metal, bringing four guitars to bear on their material and showing the listener that sometimes, overkill in the instrument and production departments isn't the worst way to approach an album. Not that the technical side is Hyperion's only strength, not by a long shot. The riffs are fast-moving and furiously alive, and all those guitars are playing something a little different. But there's a large-scale drama in the extreme elements of these tunes. Novus Ordo Secolorum's musical arrangement, for example, even without all the lovely riffing they do here, makes it a kickass song in its own right, a dark symphony that makes it a perfect soundtrack for a haunted ride across a frozen waste. Some bands' debut albums are faltering steps, and they still seem like they're experimenting; not so with Seraphical Euphony, whose opening instrumental portions are brightly confident tracks, in which the band obviously knows they have something really good and can't wait to show it off. The production matches the melodies in its purity; the translucent acoustic guitar or piano sections sit perfectly together with the furious blastbeat drumming. There's a lot of melodeath influence on the album as well, especially that of early In Flames; the twin-guitar attack on songs like Moral Evasion have a strong resemblance. The gloomy Northern European acoustic passages and keyboard backing melds perfectly with the wild guitar soloing as a whole, never dragging down the songs, and the title track, especially, has a grand vastness to it, full of hushed keyboard choruses that introduce the aggressive blasting of the guitars. Not all aggressive, however; the final track, Blood of the Ancients, is softer and more upbeat. Not going as far as some of the modern "positive/uplifting black metal" sounds, it's still way more tender a song than one expects from listening to its predecessers; vocalist Harry Lauraéus, who generally uses a harsh melodeath style, even throws in a few clean vocals. This, and a few other touches the band puts into their interpretation of melodic extreme metal, makes Seraphical Euphony a bit more approachable than the misanthropic darkness that they clearly have some aspirations towards, but perhaps this fusion of blackened death the band performs here is for the best; it certainly gives them more range for their songs to cover. The quality of that range is as excellent as the length; not a poorly-made song on the album, and even spoken-word elements that appear on a few of the songs, which can easily go wrong, sound like an integral part of the song's ambience. Happening upon this gem at the tail end of 2016 will definitely be a pleasant surprise to the listener -- it certainly was to me.